No matter how healthy you eat on a daily basis…. When you live in California, you eat at In-N-Out on occasion! For those of you not “in the know”, there is a process to ordering your meal at In-N-Out. The menu has 3 options: Hamburger, Cheeseburger and Double-Double (2 patties), Aside from fries and fountain drinks, that’s all that is posted on the menu. BUT… there is a “secret” menu and specific terminology when it comes time to order. Two of the most popular are “animal style” (includes grilled chopped onions, pickles and mustard) and “protein style” (a burger without the bun and wrapped in an iceberg lettuce leaf instead). Lots of people who eat low carb diets order “protein style” and it is not at all uncommon to see people eating burgers with a lettuce instead of a bun. 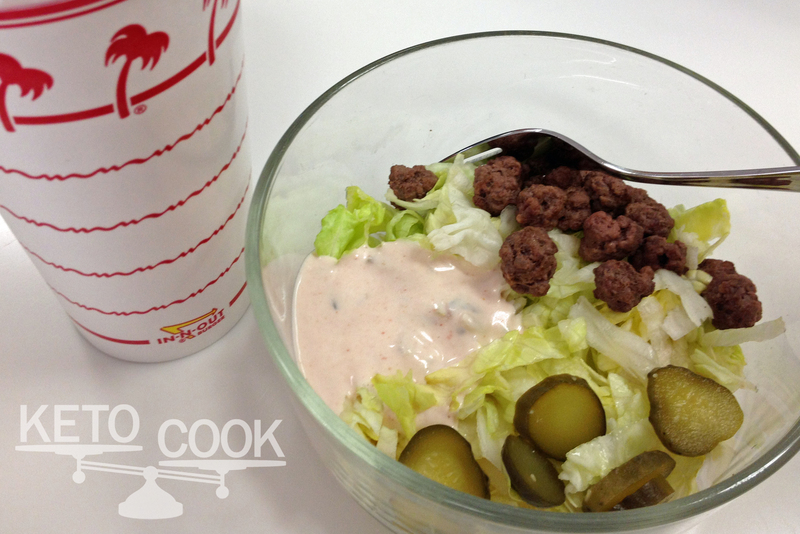 In-N-Out also has a “spread” that is very similar to Thousand Island salad dressing… the spread and “protein style” gave me the idea to calculate a salad using the same ingredients and flavors. For older kids and adults, a small hamburger patty wrapped in lettuce would be a great option to bring with you. On average, a hamburger patty at In-N-Out weigh about 30g, a lettuce wrap in place of the bun weighs about 65g (I have gotten as little as 30g and needed to ask for more) and 2 slices of tomato is about 30-40g. Here are links tot he main In-N-Out Burger website, the nutrition information (some of you may be able to actually order right off the menu!) and a link to a post detailing the “secret menu” (make sure you click the slide show) because there are even more options than what they tell you on the In-N-Out website! Chop or shred the lettuce. Top with the meat and pickles. You could add tomatoes or chopped hot chilies if you would like. The dressing can hold more oil if needed to increase the ratio. Do you take this to the restaurant? Yes we do! We take keto food to a lot of other restaurants as well, never have problems except for at the American Girl Cafe! This looks really great Dawn! I love the flavor combinations of this. I am thrilled you posted this! We miss our family In-n-Out excursions. I will definitely be making this for my son 🙂 Thank you so much for your wonderful recipes. They have made a huge difference in our keto experience. So glad you are finding helpful recipes! We love In-N-Out evy once in a while… Charlotte loves the hat and stickers just as much as eating there! Where do I find the Bubbies pickles? Is it something I need to order online? If you click the blue link, you can order them from Amazon through Vitacost (a reputable web site). I have seen them in my grocery stores as well. They will be in the refrigerator section, or near the deli. You can re-calculate with a different brand, but I love Bubbies because they are naturally fermented with no added ingredients. They taste really good! Welcome to KetoCook! My name is Dawn and I have been creating ketogenic recipes since 2010 for my daughter, Charlotte, who lives with Dravet's Syndrome. I hope you find some recipes you enjoy!